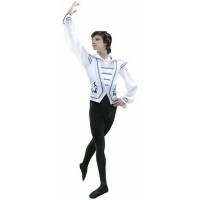 SOLOIST'S COSTUME This tunic is made in the form of a black shirt with white wide sleeves and..
ALBRECHT The costume is made as a simple vest in peasant style with lacing in the front. The sle.. It is a professional stage costume, which is made of the velvet. As decoration there were used gold.. PRINCE ARTHUR Details: camisole, collar, breeches, beret. The costume is made of dense fabric. T..